The Greek and Roman demigods will have to cooperate in order to defeat the giants released by the Earth Mother, Gaea. Then they will have to sail together to the ancient land to find the Doors of Death. What exactly are the Doors of Death? Much of the prophesy remains a mystery. . . . I'm really angry with you Mr Riordan, you are a cruel, cruel, CRUEL author. Now I have to wait an age for the next book to come out, GREAT (throws arms up in air with despair). And what makes it worse is that you threw in the cliffhanger, and a HUGE one at that. I'm going to die waiting for this book. Thanks a lot!!! 1. It made me want more, which will probably happen to everyone who reads this, so I think Rick Riordan can look forward to a lot of money in his future. 2. It brought a massive unexpected twist to the story, especially since I expected a happy ending (I thought it was a trilogy! stupid me!!!). This twists does bring out great things in the authors writing, and will keep people begging, wondering and worshipping for his work. 3. It brought life to book, as I felt that the story was being dragged out, and the things that happen felt really repetitive, monsters this, prophecies that, Gaia, Gaia, Gaia every where. Throwing (SPOILER!!) Percy and Annabeth into Tartarus will bring out a more psychological side to the story, and will definitely change the way things are run. Although I really enjoyed it, I thought that the writing was way to immature for the book. The seven of them-Jason, Piper, Leo, Hazel, Frank, Annabeth and Percy-are all teenagers now, and can't be describe in a way that makes them look like ten-year-olds. And on top of that, six of them are dating (except for poor Leo), and their relationships feels like its five years to young for them. I think that Riordan needs to step up with the writing style, otherwise, he his going to lose some of his older fans, and that won;t be good for anyone. My favourite character is still Percy, even if he goes a bit weird sometimes, he is still pure awesome. And I love how he is so nice and kind to Annabeth, it brings a real soft side to the once tough son of Poseidon. I never really like Jason, or Piper, they seemed to out of things, like there isn't a world about to end. Jason never really looks past himself, and he reminds me of that Narcissus guy, the one who fell in love himself. Jason seems really similar to him. And Piper is always worried that Jason will run of with some other girl, like Reyna, and even Annabeth, which I believe to be plain stupid. I think Piper isn't that clever, and might be all charmspeak and looks, even if she tries not to be. I think that Frank is a sweet, loveable character, and Hazel seems to bring a bit of mystery, happiness and sadness at the same time, into the story. And Leo. He brings humour, and you can't help be sorry for him, and even more so when he is told he is the seventh wheel, which sounds like he will never has his someone. He his rejected by everyone, and that makes me like him even more so. The Mark of Athena is a another greek/roman adventure, with your favourite characters, and new ones as well. This book is another great installment of Rick Riordan's mythological series. ARE YOU SERIOUS RIORDAN? YOU HAD TO MAKE US WAIT FOR A YEAR AFTER THAT CLIFFHANGER?!!!! WARNING TO ALL: ENORMOUS CLIFFHANGER. I AM GOING TO SPEND A WHILE RAVING ON ABOUT IT. No, the caps lock key on my keyboard is not broken. I just felt that this cliffhanger deserved all those capitals. ARE YOU FREAKING KIDDING ME?! Now I shall have to spend a year just thinking about all the possible ways Percy's awesomeness will get them out of Tartarus without becoming mentally/physically eternally damaged on the way (i.e. become insane/die). I was SO sad/heartbroken and the only thing that made me feel a bit better was that Nico admitted that Percy was more awesome/powerful than Jason. (Ha! Take that Jason!) Don't get me wrong, Jason is really cool, but Percy is just awesomer. Now, onto the actual book. Sorry about all the ranting and raving. If you have got this far without flipping onto the next review, I am proud of you. I practically had to wrestle this book off my brother, he is so into this series, but I eventually got on to reading it. 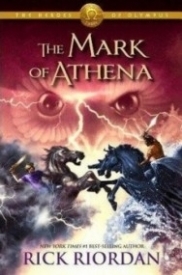 Mark of Athena is where the two camps unite. Sort of. Scratch that, it is a TOTAL FAIL with the whole joining forces thing. Everything is going JUUUUST fine, then of course Leo gets possessed and starts blowing up Camp Jupiter, leaving the Romans hungry for revenge and Jason/Piper/Leo/Percy/Hazel/Frank/Annabeth fleeing for their lives, resigning themselves to the fact that NO, they aren't going to get the Roman's help. And then, of course, everything is just perfect, and I was ready to go "Hooray! Everything's right with the world and I can sleep easy until the next book comes out" But then of course that CLIFF-HANGER. The universe seems to have a problem with Reyna. I mean, did she get on the wrong side of Aphrodite/Venus or something? Because she seems to have NO LUCK with snagging awesome superheroes. Both Jason and Percy turned her down in favour of Greek girls, and I don't think that would make me very happy, if I were her. Of course, the universe seems to have a problem with all of their relationships. The only time Percy and Annabeth really get back together and show how much they love each other (because all the other times they were in life-threatening situations/really worried about each other/not together at all) is before the cliff hanger. I will not say what it actually is, because I wouldn't want to spoil this. And I wouldn't worry about there being anything more than kissing. They may be sixteen/seventeen, but there is nothing more than that. Anyway, I promise you, this book is something you DON'T WANT TO MISS!!! READ IT!!! I just finished Rick Riordan’s "The Mark of Athena" and there was one resounding thought I was left with: Poor Reyna! The poor girl just seems to get problem after problem thrown her way, and she’s not even a major character in this book. The main problem with Reyna is that she has fallen in love with both Percy Jackson and Jason Grace, and both demigod superheroes have turned her down. That’s not to say she doesn’t have a lot to offer. Home girl is a praetor of Camp Jupiter, she’s a daughter of some feisty war god, and hundreds of Roman demigods have deemed her worthy enough to lead them into all sorts of life threatening battles. But for some reason, Percy and Jason just don’t see it and leave her hanging on by a romantically hopeless thread. I sure hope that Riordan has something good in store for this girl, because for now, she just keeps getting the short end of the stick. I’m not used to a situation where I am still left feeling sorry for a character at the end of a book. Normally all their problems have been wiped out or dealt with in some fashion, but not for poor Reyna. I can't wait to see how her life plays out in the next book. In terms of how this book stacks up with the other Percy Jackson adventures, it's classic Riordan. That is to say, it's a fun read, and I definitely recommend it! More Greek/Roman adventures to be had.